If you submit a paper to Radiology that uses the term “low dose,” it’s not likely to be accepted. Learn why the journal has targeted the term for extinction. 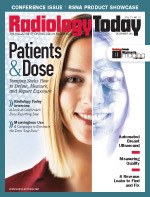 Radiology Today interviewed Ascendian President and CEO Shawn McKenzie on the ramifications of the law in California that requires radiation dose reporting. ASTRO visited Boston in late October. Take a look at some of the interesting research presented at the meeting. Recently approved for screening, U-Systems’ ABUS finds cancers and reduces operator variability. While unsettled, reimbursement concerns seem headed in the right direction. Are Your Orders in Good Order? An expert answers common questions about obtaining proper exam orders. The ranks of patients with peripheral artery disease are expected to grow, due partly to the obesity epidemic and an aging population. According to some in the industry, this presents a great opportunity for interventional radiologists interested in diagnosing and triaging these patients. 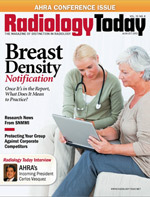 Breast imagers face the dual challenge of keeping up with regulations while improving workflow. 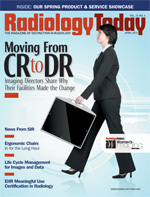 Direct digital radiography is expanding, but CR has not left the building. 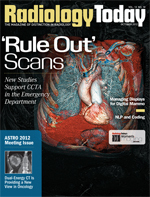 Three new studies support the use of CT scans for low-risk patients presenting with chest pain. Not everyone agrees, but doctors are exploring how to best use the tool. 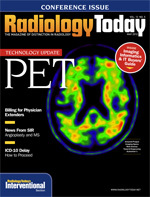 Dual-energy CT is providing a new view in oncology imaging. 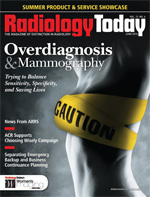 Interpreting mammography requires the highest resolution display of routine exams. Making sure the display does its job so the radiologists can do theirs is an ongoing effort. Brian Klepper, PhD, said in his AHRA keynote address that new, intense competition on price and margin is the future of radiology. 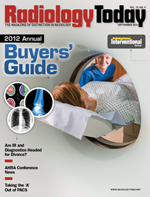 Some see a trend toward separate IR and diagnostic practices in radiology’s future. Considered both helpful and confusing for patients, notification laws are expanding across the nation. 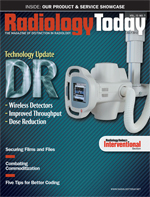 Whether it’s from thieves intent on stealing X-ray films for silver or from other, digital threats, radiology departments must take steps to protect patient information. The FDA’s recent alert on adverse events underscores the need for controlled studies on the CCSVI theory’s risks and benefits. The ACR has joined the American Board of Internal Medicine-led Choosing Wisely campaign to reduce unnecessary care, reduce patient dose, and help curb healthcare costs. A new study finds overdiagnosis with increased screening, but there’s no way to determine which tumors do not need to be treated. In addition to providing a foundation on which to build hybrid technology, recent PET advancements focus on cardiology, neurology, and oncology. 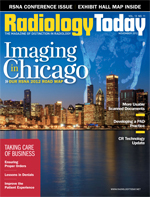 Radiology Today recently spoke with Don Rodden, president of the Healthcare Billing and Management Association, to learn his thoughts on how radiologists should prepare for ICD-10. Investigators discussed research about the controversial treatment at the Society of Interventional Radiology’s annual meeting in March. Imaging directors share why their organization made the change. When it comes to workplace ergonomics, radiologists are becoming the patients, with job-related musculoskeletal injuries on the rise. The right chair—with the right training—can help. One vendor details its process in getting its EHR MU certified as well as what the stage 1 requirements mean for radiologists. SIR 2012 hit the streets of San Francisco for the society’s annual meeting. Read our coverage of some of the key presentations. At a Wisconsin healthcare system, radiologists and gastroenterologists are setting aside sometimes differing viewpoints on colon cancer screening techniques to increase screening rates in a team effort. Is Your ‘Chain of Trust’ Strong? Your HIPAA protection isn’t complete without strong business associate agreements. While not perfect, simulation-based training has value in radiology instruction, particularly for interventional radiology. Is It Time to Rethink Your Archive Plan? Study Finds DVT Catheterization Safe in Pregnancy; Study Examines Embolization for Recurrent Nosebleed; Can Angioplasty Improve MS Symptoms? 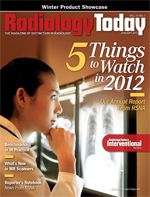 Cloud technologies are becoming more familiar to consumers and radiologists alike. 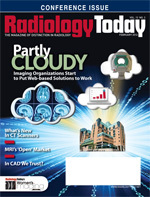 Radiology Today spoke with three imaging organizations for their experience with the cloud in relation to image sharing and storage solutions. 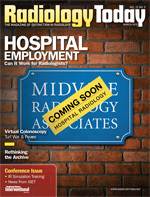 More hospitals are opting for open MRI units as they see quality and patient comfort improvements. The newest CT offerings focus on reduced dose management, faster diagnosis, and more efficient workflow. Breast-specific gamma imaging seeks to speed diagnosis and reduce false-positives. Vendors focus on patient-friendly characteristics while maintaining image quality in the newest MR offerings. The traditional radiology model of a contract with a private radiology group augmented by preliminary reads on nights and weekends is increasingly facing challenges from different practice models. Software can help interventional radiologists share anonymized practice data to assess performance.